Oh peachy pink lips, will I ever get tired of you? That is a stupid question as the answer is clearly not. Never ever, Nuh uh! 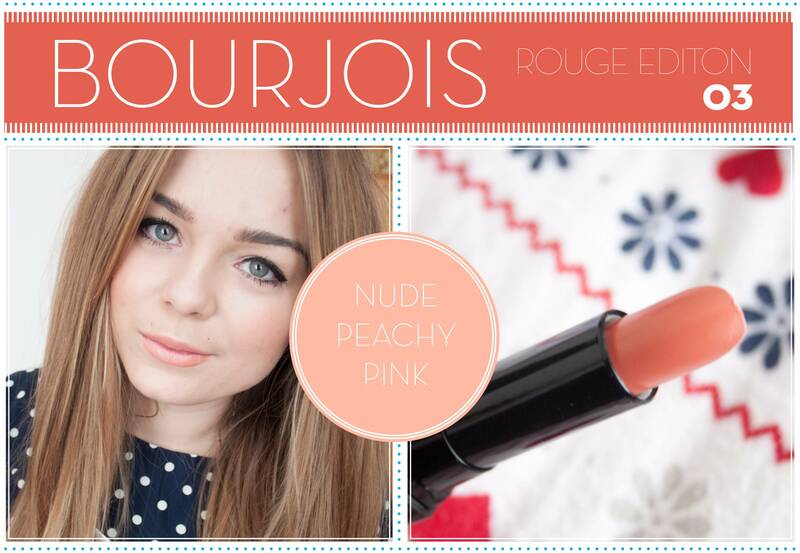 Currently topping my list of favourite lipsticks for spring has to be the Bourjois Rouge Edition on 03 Peche Cosy. The colour is quite slippy on the lips, it's a sort of creamy/silky while also being something that sits a little on the surface, It wears comfortably overall though. The Rouge Editions have no noticeable taste, but I do get a hint of "fakeness" if you know what I mean! The pigmentation is spot on and covers my dark, pigmented lips with one swipe and the opacity isn't patchy in the slightest. I actually have all the Bourjois Rouge Edition Lipsticks, they come in a whopping 16 shades so there is something to suit everybody. I'll review the rest in time but for now this one is definitely my stand out shade from the range and a Spring lipstick must have!